Gwyneth, Do You Hear Me? Dear Gwyneth, We&apos;ve written to you before, dote on you often, and find ways to use your editorial shots whenever we can. I&apos;ve been following your career since you were doing TV movies--the one where Robert Urich is your husband-murdering dad is amazing, along with the one where your real mom plays your mom and you have a D&D obsessed brother who goes bonkers. Love. And don&apos;t even get me started on the big screen stylings of Margot Tenenbaum and Marge Sherwood. Call me a fan girl, call it a girl crush. Whatever. I&apos;ll own it. And on the clothing front, I cannot lie about the fact that you&apos;ve had a huge influence. The names Koi Suwannagate and Blue Cult came into my vocabulary via you, just to name two. 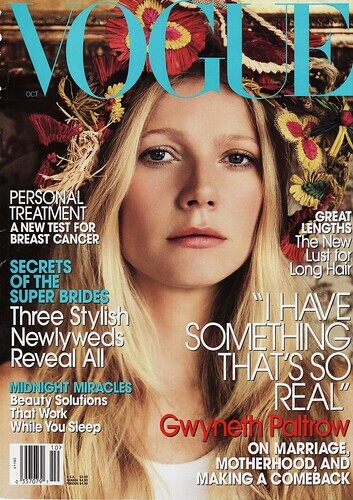 You still have my favorite American Vogue cover in recent memory and just pretty consistently amaze me stylewise. And I covet your hair. I love GOOP, I do. I still look forward to it on Thursday mornings. But here&apos;s my beef: not enough fashion. In fact, there&apos;s barely any style stuff at all these days. The food bits are nice and all (loved the PBS show with Batali and Bittman) and I get that it&apos;s a passion of yours. The books and music? Also cool from time to time. The parenting advice? Not so much. I know fashion is one of your loves too. So can we pretty please hear more about that? You&apos;ve got the ultimate insider POV and we want to share it. Also if you wanted to sell some of your stuff on eBay again...that wouldn&apos;t be terrible. Thanks much.